Every October, I make it a point to play as many horror games as I can. Halloween must have come early this year because this week we had an impromptu marathon of zombie games. We played Zombie Fluxx, Zombies!! !, and Zombie Cinema. While each game shares a theme, they all played differently. 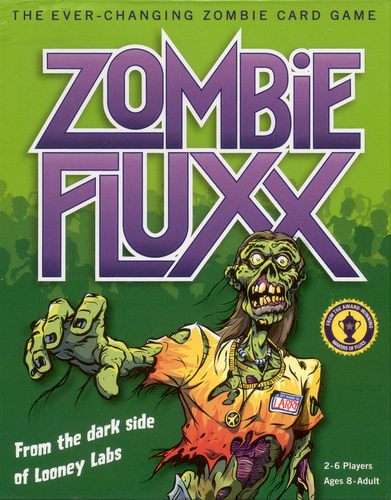 Zombie Fluxx was my first Fluxx game. I’m not familiar with the rules for the vanilla game, but I found Zombie Fluxx’s mechanics to fit the zombie apocalypse theme well. The combination of the goal cards and the creeper cards were key to creating the tension of survival, but the game still maintained a great sense of humor. Zombie Fluxx’s Creeper cards are naturally Zombies, and they get played in front of you immediately after they’re drawn. They prevent from winning the game if they are in your play area, so you need to clear them out as quickly as you can. The goal can change throughout the game, and they represent a variety of scenarios you’d find in a zombie flick. Sometime you need the lumber and a friend to build a barricade, but sometimes all you need is a can of gas and a car to drive away to victory. Zombie Fluxx was a lot of fun, and I recommend it to anyone who enjoys irreverent zombie media like Stubbs the Zombie or Raising Hell. One Halloween many years ago, Zombies!!! was one of the first non-Parker Bros. style board game I ever came across, but someone snagged the last copy before I had chance to buy it. Now that I’ve had a chance to play it, I don’t think I was missing too much. The basic premise of the game was solid, escape the town while killing as many zombies as you can, but its execution left much to be desired. As you explore town, tiles are revealed and placed to generate a different map each time you play. As you explore the map you roll a die to move, attack zombies, and move zombies. This works well until it is time to draw cards. These have a variety of effects, and most of them are meant to be played on your opponents. When your adversary thinks they rolled high enough to leave the police station, you can play “Your Shoe Is Untied” causing their roll to drop to half. This works out great at the time, but when a card like this gets played on you every turn, it gets old fast. On top of that, most of the positive cards can only be used in specific locations which tend to make them useless. Because of the constant play of hindering cards and the high goal for zombie kills, the game goes on for too long. I’m surprised there are so many expansions. I gather that the expansions include special rules, so maybe those speed the game along. 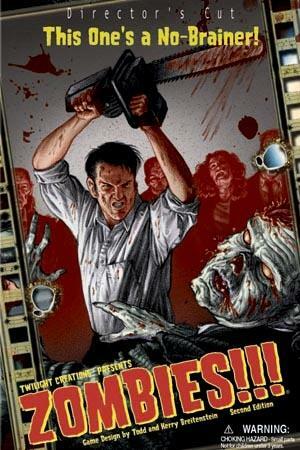 Zombie games are in plentiful supply, so it is difficult to recommend Zombies!!! over something like Zombie Fluxx. The best zombie game we played all night was Zombie Cinema. I bought it purely because it comes in a VHS case. Not that the case needs to hold much anyways. There are a couple of pawns, dice, and a small board, but they are all of low quality and could easily be replaced with anything you might have at home. The important part of the game is its small, six page rules pamphlet. 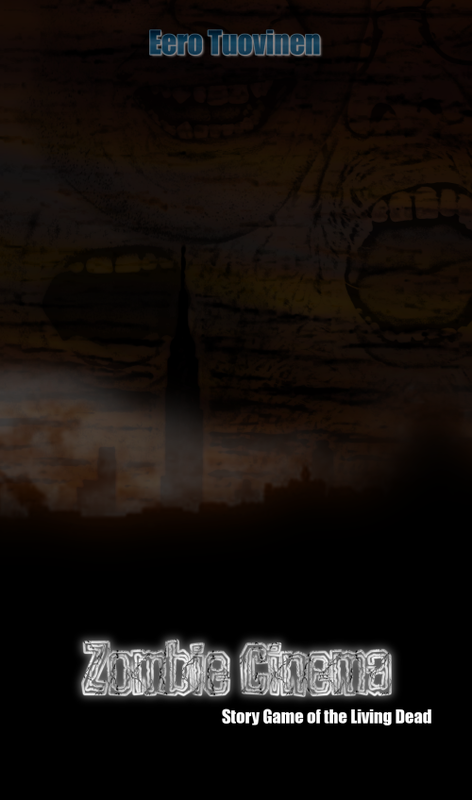 Zombie Cinema is a roleplaying game, but more accurately it is a cooperative storytelling game. The first player frames a scene, and then the other players jump in to narrate a ghoulish horror story. Character creation is done by drawing three cards that describe your character and their motivations, but these are purely optional. We had a lot of fun with them though. I was a family man with unrealized potential and great lust, and other characters had even wilder combinations. The cards all have some creepy art (the Mental Illness card depicts a man kissing a pig), and the text is just amazing to read. I don’t know if its purposefully terse, or just oddly translated Finnish, which is where the game originates. Free from society? Easy Profits? New Lifestyle? Validation? Disaster is great news for one in my position, for sure. Whether you find the text odd or not, it does provide enough motivation as you tell the story. The game recommends you frame the first scene as “your town, tonight,” which is exactly what we did. We started the story with our characters playing Zombie Fluxx, as to not be too meta, as a zombie pizza man came into the store. It’s important to note that you only advocate for your character, and you don’t actually play as them. Which is how another player decided that my character looked like a zombie as he lustfully devoured a pizza, so he shot me. Obviously, I did not want this to happen, so I was allowed to initiate what the game refers to as a “conflict.” Dice are rolled, and the winner then takes control of the narration and tells what really happened. Whenever a conflict happen, pawns move on the board. There is a pawn for each player, and one for the zombies. After a conflict, the winners move up towards victory, and the losers move closer to the zombies. If the zombie catches a player, it automatically eats them unless one player is willing to sacrifice himself to save one other player. We escaped from the game store, and made our way to a local farm. Unfortunately, there were even more zombies there and that’s when everything came crashing down around us. We had our first player death when the character who was my character’s father sacrificed himself for me. As we escaped the farm, I acted as a coward and initiated a conflict which propelled me to escape, while everyone else in the car died when the zombies swarmed it. We played the game with a lot laughs, but for gamer’s who like to tell terrifying stories around the campfire, there is a lot to work with in Zombie Cinema. Zombies!!! would be a good pick for players who just want to roll dice and stack a pile of undead corpses in front of them, and Zombie Fluxx hits a good medium between gameplay and zombie horror. As we found out, you don’t need to wait for the jack-o-lanterns to start appearing on porches to enjoy a good scare. I think the review here for Zombies!!! 2nd edition game boardgame is poorly depicted…Playing cards adds to the strategy of the game, some cards may be useless at a particular point in the game but you can discard it at the end of your turn if you wish to draw another-it’s called strategy. If you are ot into strategy based games, then the game is not for you. If you are getting tired of players playing cards against you to keep you from winning, that’s too bad, go watch a soap opera then.. I can see your a fan of Zombies!!! and are willing to defend it, which is admirable. I gotta agree with Dave here, though: Zombies!!! is about rolling a bunch of dice and playing a few cards. Even you mention that one of the major strategies is constantly discarding cards at end of turn to get the card you want… which is an earmark of poor design. In theory, a well-designed game makes you want to play all the cards you draw. But, I don’t think Dave was ragging on Zombies!!! so much as being a cheerleader for Zombie Cinema. The Guilt-Free-Games / Myriad Games Presentations crew plays a LOT of games – We learn about 2 new games a week – and sometimes we come across a great game from Sweeden that we know no one else will play because it is so indie… that it just makes us want to cry. It’s probably the same way you feel about Zombies!!! when ‘normal’ people talk about Monopoly or Risk. I’m pretty aware that Dave is into strategy games. Zombies!! !, though, just ain’t one of them. After I originally left a comment I appear to have clicked on the -Notify me when new comments are added- checkbox and now each time a comment is added I recieve four emails with the same comment. There has to be an easy method you are able to remove me from that service? Many thanks! you’re a great author. I will make sure to bookmark your blog and will often come back down the road. I want to encourage you to definitely continue your great job, have a nice afternoon! I think the title needs a couple more zombies. 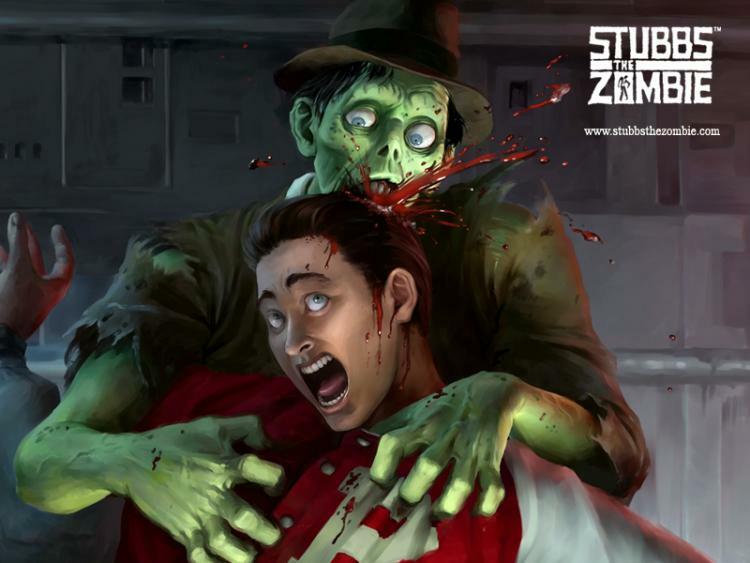 Where did you actually end up getting the tips to compose ““Zombies! very own Moshi Monster to get involved in the fun. There are mornings when, odds are, you will be greeted by a awesome wind with a sweet scent. -Julie Yamamoto: is the love interest of Ben and later becomes his girlfriend.